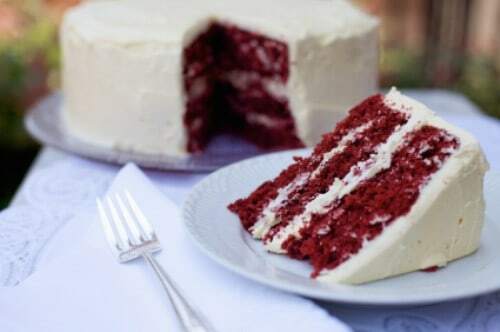 This is a dense old style Red Velvet Cake. A chocolately cake is topped with a fluffy vanilla frosting. 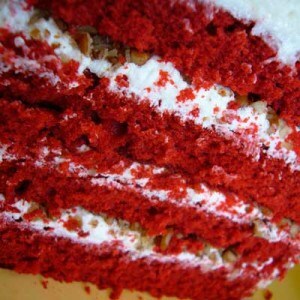 Make the well-known Waldorf Astoria Red Velvet Cake at home. No cake mix needed. Cake Instructions: 1. Make a paste of cocoa and coloring. 2. Cream shortening, sugar, and eggs. Add cocoa and; food coloring. Mix well. 3. Add buttermilk with vinegar and flour with salt alternately. 4. By hand, fold in vanilla and baking soda. 5. Grease and flour cake pans. Makes 3 layers. 6. Bake at 350 for 30 minutes. Frosting Instructions: Cook until thick- flour and milk. Beat until creamy - shortening, margarine, sugar, vanilla. Mix together and add milk and flour mixture a little at a time and beat well. Because my birthday is on Valentine’s Day my mother made this cake for me every year. She even managed to send it to me when I was in boarding school in the sixties. So happy to find this recipé as I have lost her’s. Thank you. My friend used to make this..so much better than cream cheese frosting. HEART ATTACK ANYONE? YES, IT DOES LOOK GOOD BUT THINK ABOUT IT A FULL CUP OF SHORTENING? LOOK AWAY! LOL.